Disney has started to reveal Sketchbook ornaments! Hooray! Check out Mary Poppins in Jolly Holiday! There's Mr. Big from Zootopia as well, and Alice in Wonderland sitting amongst giant, colorful flowers. New this year are some characters under glass domes - Jiminy Cricket riding a seahorse, and Tinkerbell. Eeyore in a glass globe looks very spring-time with flowers painted on the glass. There is also a Tangled/Rapunzel singing ornament that looks like a music box. Price increase on singing style... it's listed at $19.95. Some repeats include baby Groot and the UP! house (drat, I should have sold my extras earlier). Elsa at the balcony singing is also repeated, but is again at a higher price than before ($19.95). The "Pretty Princesses" again have the shorter skirts with dangling legs. New this year in that line are different colors instead of so many in pink. Mulan has yellow with light green trim, and Ariel has a medium green skirt. As you would expect, Cinderella is in baby blue and Belle is in yellow. It may just be me, but I hate that Mulan ornament. That dress is too flounced out to me. Love the Mary Poppins ornament the most! And I like the Tinker Bell ink footprints. That's a cute touch. Buzz is a repeat too. First image isn't working. I wish the Alice ornament was a singing ornament that played "In the Golden Afternoon." Cinderella's frilly princess dress actually kind of looks like her, finally. Great start, and a nice surprise. While I'm here, some of you already know, I started a Facebook Group for Sketchbook collectors! Just request to join. Moved the Sketchbook ornament collection pictures there too. I don't see a Buzz ornament. How/Where did you find it? That would have been fantastic. They've done that before, haven't they? Didn't Aladdin and Jasmine on the magic carpet on the clouds start off as non-sound, and then in later years they added sound? Maybe we need to encourage Disney to do that again? I started a Facebook Group for Sketchbook collectors! 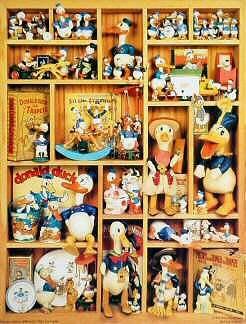 Luckdragon has done a tremendous job uploading photos of the Disney Collections! It'll be a fantastic reference site. I highly recommend joining, but be prepared for getting ornament envy and it spurring back collecting! LOL. My Wi-Fi failed right after posting on here, so I didn't even get to upload the photos to the Facebook group. I just went onto do some errands and spent probably half an hour at Hallmark looking at ornaments. For the Aladdin/Jasmine ornament, the musical one is a new sculpt. The previous one that didn't play music actually had a cloud too (and a better sculpt; I have both of these). I think you're thinking of the Tangled musical ornament of Flynn Rider and Rapunzel in the boat. They added the base/water when they added the music. Grateful that they did since the original was pretty hard to find. Now, both are hard to find. C'est la vie. I love the new Disney afternoon mugs! So cute! Love that Mary Poppins/Jolly Holiday ornament. Absolutely love it! The UK Disneystore now has a range of sketchbook ornaments listed. The Chip ornament is featured on several Instagram posts, and I did see part of Lumiere next to him in one. These are sculpts I've never seen before. The Lumiere one lights up (awesome), and the Belle one seems to sing. I asked on Instagram if that's true, so we'll see. Very excited, but this is a huge amount of ornaments for a movie that doesn't have an anniversary since you also have to count the frilly princess Belle. So far none of the regular Sketchbook interest me. I do like the Mickey 75th and Chip & Dale Legacy ornaments. Shop Disney failed us this morning in favor of their Halloween line-up. *sigh* Well, I was able to order the Haunted Mansion Doom Buggy ornament. Much cheaper than ebay and free shipping. I was hoping for more on the site again today. Sigh. They are trying my patience. LOL. They added some more today. Disappointed in today's additions. Some reissues from 2017 (great news if you missed out on Grumpy last year), more frilly princesses, talking Darth Vader, Spider-Man, DuckTales (current series), and a very odd looking Jack Jack disguised as Edna Mode. None appeal to me except maybe Darth Vader. They added the Legacy ornaments too except Peter Pan. Those appeal to me except Marvel. None of the regular Sketchbook ornaments interest me. Only the legacy sketchbook are on my list. SO many repeats! Ugh! Mary Poppins on her umbrella AGAIN. Grumpy playing piano again! (I bought a couple hoping it would be good as trade fodder for some I missed. Pooh!) Up house AGAIN (is this three years in a row now?) Pascal in the lantern again! Ok, I won't complain about that one as I missed it last year. Haha. Repeat of Buzz in the Alien claw rocket. Repeat of the Enchanted Rose. Is that Winnier the Pooh stacker a repeat or just similar? Singing Elsa on the balcony repeat. Alice in Wonderland doorknob repeat. I'm sure I'm missing some, but seriously, there are a ton. Just way too many, especially too many from recent years. I want to see more new designs. Bah humbug. Maybe they are holding back on new poses/characters to drive sales to the (higher price point) Legacy collection? Still hoping for more Sketchbook ornaments to be added. Also hoping for a sale too ! Yeah, I'm hoping for more. I'm fine without a sale since October is when the first good sale is. Maybe Sorcerer Mickey and maybe Darth Vader. I do wish they would put up sound clips. If they don't add anything else (and I feel like they will since BATB is over-represented), I probably will buy those two. I can wait till October. So far I like three of the Legacy ornaments, and a none Sketchbook. I just saw the 2018's at the local Disney Store. However the Legacy and Sketchbook ornaments are mixed in together, which might lead to some confusion for customers who may not check the pricing & assume that all are the same/(lower) price. This years offerings are certainly lacking. Oh well saves me money. I've bought two of most designs in the past but now rethinking that decision as I just have too many ornaments so will perhaps sell off the duplicates later this year . . . time permitting. IF not, then next year. Then spend the proceeds on acquiring some of the ones I missed before I started collecting the Sketchbooks and staying loyal to Hallmark for so long. So far not much on my Sketchbook list. Like a few of the Legacy line, but need a sale to bring the price down. Generated in 0.040 seconds in which 0.007 seconds were spent on a total of 14 queries. Zlib compression enabled.